1959 January, Cuba's atrocities start when Fidel Castro enters havana with the support of many many people he later betrays, manipulates, and murders. Fidel Castro and his troops entered havana with the support of many many rebels, mostly anti communist, which Fidel Castro laters betrays and murders. And thus begun the conversion of a once tropical latin Caribbean island into a soviet style communist Kremlin, floating 90 miles away from the United States of America. Similar to a Stalinist soviet concentration camp where 50 years later, popular Cubans like Yoani Sanchez are held hostage and strictly prohibited from leaving the island's imaginary prison walls. 1959, Fidel Castro and his troops enter Havana without having to fire a single shot shot from their guns. Fidel Castros troops called July26 Movement was supported by many many anti communist Cuban rebels which the Fidel Castro regime later betrays and murders. Fidel Castro is quick to nationalize all properties and corporations in Cuba belonging to citizens and foreign investers. Fidel Castro appoints himself prime minister, dictator, of Cuba and has been doing the same for 50+ years without any consideration and respect for human rights or what the Cuban people need, want, and say. And poor Cuba, she's in shambles from the sand up because of the neglect for all living things the communist Castro regime has and has implementated on the Cuban island for the last 50+ years. 1959 -, Through out the Cuban island, young boys and their fathers were executed in firing squads held by Fidel Castro, Raul Castro, Che Guevara, and their henchmen. Fathers and sons were pulled and dragged out their houses and far away in the middle of the night, Gestapo style, and in front of their families. Many innocent Cubans were murdered by Che Guevara and Fidel Castro without any form of court, judge, trial, or legal representation. They were murdered in a nomadic fashion 30x times over the brutality of the previous dictator Fulgencio Batista. Fidel Castro's new and false socialist communist system will soon prove to be a "deficiency system" 30x times over and as brutal and oppressive as the last dictator Fulgencio Batista. Fidel Castro appointed Che Guevara head of all firing squads in Cuba. Che Guevara is known and responsible for murdering thousands of innocent young boys and their fathers. This type of "genocide" in Cuba was intended to wipe out any possible suspected oppositions, "possible suspected oppositions", to the RULE and rules of Fidel Castro's communism. 1962 September, The socialist Castro regime and Soviet socialist governments began to secretly and in a surreptitious fashion build bases in Cuba for a number of medium- and intermediate-range ballistic nuclear missiles (MRBMs and IRBMs) with the ability to destroy most of the continental United States. A United States U-2 photo reconnaissance plane captured photographic proof and confirmed the presence of Soviet nuclear missile bases in Cuba and the nuclear missles pointing directly towards the United States of America. 1972, Pedro Luis Boitel, a poet and student leader dies from a hunger strike in prison while protesting inhumane conditions in Cuba. It was the first time an opponent of the communist government died during a hunger strike to protest against both, the Fulgencio Batista and Fidel Castro dictatorships. In February 2010 Orlando Tamayo Zapata will be the second innocent prisoner to die of a hunger strike while protesting againt the castro regime. 1996 February, Dictator Fidel and Raul Castro orders several of their soviet MIGs, from the Cuban Air Force, to shoot down two 2 small civilian cesna aircraft over international airspace. Three U.S. citizens and a resident of Florida were assassinated when their two civilian Brothers to the Rescue aircraft, on a humanitarian mission, were ambushed over international airspace by several soviet MiGs from Cuba's Air Force. Carlos Costa, Armando Alejandre, Jr., Mario de la Pena, and Pablo Morales were on a "Brothers To The Rescue" humanitarian flight when the Cuban communist regime ordered several of their soviet MIGs to killed them in mid sky. Brothers To The Rescue is responsible for helping and assisting over 4,500 people at sea with help and aid. "Brothers To The Rescue" aided many rafters at sea make it safe to dry grounds without drowning, dehydrating, or getting eaten by sharks in the Florida straits. Many whom were Cuban rafters trying to escape Castro's Communist Hell in Cuba. The shootdown was ordered by communist Cuban dictator Fidel Castro. Fidel Castro and his accomplices in Cuba and the U.S. have not been criminally indicted. Visit Hermanos.Org to read "The Shootdown Of Brothers To The Rescue Aircraft"
1998, Fidel and Raul Castro's communist regime, sends and deploys five Cuban terrorist into the United States to infiltrate several U.S. military bases and to spy on Cuban exiles in Miami Florida. The five Cuban terrorist, also known as the Cuban 5 Five (Gerardo Hernandez, Antonio Guerrero, Ramon Labanino, Fernando Gonzalez, and Rene Gonzalez) are five communist Cuban intelligence officers convicted in Miami of espionage, conspiracy to commit murder, and other illegal activities in the United States. The Five communist terrorist were in the United States breaking laws, in posession of fire arms, explosives, and threatening U.S. national security. At their trial, evidence was presented that the Five terrorist infiltrated the Miami-based exile group Brothers to the Rescue. Brothers To The Rescue is responsible for helping and assisting over 4,500 people at sea with help and aid. "Brothers To The Rescue" aided many rafters at sea make it safe to dry grounds without drowning, dehydrating, or getting eaten by sharks in the Florida straits. Many whom were Cuban rafters trying to escape Castro's Communist Hell in Cuba. Trial, evidence was presented that some of the communist terrorist obtained employment at the Key West Naval Air Station in order to send the Cuban government reports about the base, and had attempted to penetrate the Miami facility of U.S. Southern Command. On February 24, 1996, two 2 of the three 3 Brothers to the Rescue aircrafts were shot down by Cuban military soviet jets in international airspace while flying away from Cuban airspace, killing the four US citizens aboard. One of the Five terrorist, Gerardo HernÃ¡ndez, was convicted of conspiracy to commit murder for supplying information to the Cuban government which according to the prosecution led to the shootdown of the two 2 civilian cesna aircraft operated by Brothers to the Rescue. The Five 5 terrorist, "Cuban Five", were communist Cuban intelligence officers who were part of "La Red Avispa", or Wasp Network, which the Federal Bureau of Investigation (FBI) dismantled with 10 arrests in 1998. The group of five (5) Cuban terrorist were convicted on all 26 counts in the United States District Court for the Southern District of Florida in Miami, including the charge of first-degree murder against Gerardo Hernandez the terrorist cell's leader. Communist Cuban intelligence officers are terrorist. Ring leader Gerardo Hernandez was the shot caller of the group. Gerardo Hernandez, the terrorist cell's leader, exchanged betraying information with the Cuban communist government regarding Brothers to the Rescue's flight plans which lead to the murderous shoot down of two 2 small unarmed cesna airplane by several soviet MIG fighters over international waters killing four people. A plot to kill CIA agent Jesus Cruza Flor in Miami. (5) Trying to infiltrate several U.S. military bases. Five of the ten arrested accepted a plea bargain agreeing to tell the truth and testify against the other five in exchange for lighter sentences. Four more terrorist that were arrested are fugitives now and believed to be hiding in Cuba. 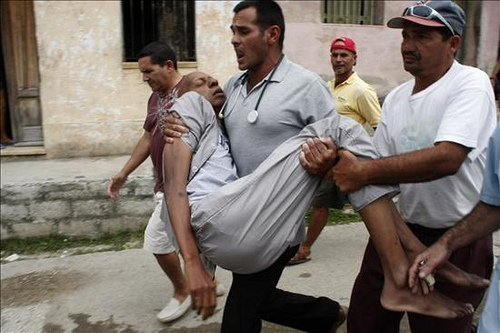 2007, Respected Cuban doctors are tortured and beaten. Two doctors, Dr. Consuegra and wife are beaten by government officials when they decide to stop working for the medical board's unsafe socialist hospitals. The doctors were in disapproval of working for the communist Castro regime in unsafe facilities were mal practices was a norm on a daily basis. These doctors also wanted to leave the communist stricken island and eventually got their parting gift of a brutal beating from the communist Castro regime. 2007, Journalist is beaten to a pulp for emailing his journals abroad. Guillermo Farinas Hernandez is known for reporting on various injustices committed by the communist Castro regime in and around the island of Cuba. Always exposing how communist government agents beat, harass, and spread fear among Cuban dissidents. 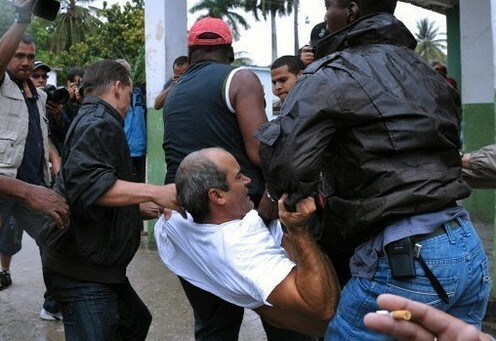 Guillermo Farinas Hernandez, an unviolent peaceful man was beaten up badly then imprisoned for his journalism in Cuba. 2007 December 10, December 10, is Human Rights Day, which dates back to the 30's in Cuba. On this day, pro-democracy leader Dr. Darsi Ferrer, his wife Yusmaini, and a small group of Cuban dissidents attempted to demonstrate a peaceful march to the University of Havana social studies department. The March was also in protest against inhumane conditions in Cuba and the lack of respect for human rights the Cuban communist government has for its citizens. This march to the university was halted short distance when Dr. Darsi Ferrer and his group were assaulted by communist state workers, undercover plains clothe agents, and street thugs paid for by the communist Castro regime. Dr. Darsi Ferrer and his group of peaceful dissidents were physicaly assaulted by chairs and sticks leaving them suffering with huge bruises and welts on their faces. This assault went on for a long time all the while some uniformed state police stood by laughing at everything. After the assault, the group was then dragged to unmarked little cars and driven away to seperate jails and imprisoned for several days. These Cubans came out speaking for their rights as humans and were mobbed and assaulted violently. 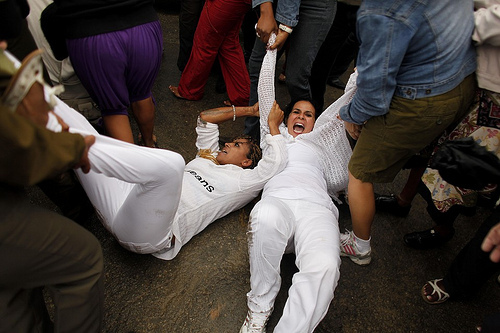 2007 December 10, The Ladies in White are better known as Las Damas de Blanco is a group consisting of brave women, many who have lost their love ones to Fidel Castro's murderous atrocities or have love ones being held as political prisoners for speaking out against Castro's communist regime. We're talking about political prisoners that are unviolent educated people that hold peaceful marches, help and educate others, and more importantly speak their conscience. Las Damas de Blanco are mostly Cuban women but have other supportive female members from all around the world ranging from Russia, Yugoslavia, Mexico, and Kosovo. Besides the groups usual weekly Sunday march after Church, Las Damas de Blanco also tried to hold a small peaceful march in great support for better human rights in Cuba. They were harassed and shoved around by an all male police force sent by Fidel Castro to detained them and stop their unviolent activity. All were sent and some were dragged to jail where their personal property, passports, and flight tickets got consfiscated. Many of them were being prepared and processed for immediate removal out the island. These Cubans came out speaking for their rights as humans and were mobbed and assaulted pretty violently by their 50 year old oppressive goverment. 2010, A mob of 600 pro Castro thugs and Cuban armed guards gather in Banes, Cuba to prevent Reina Luisa Tamayo from visiting her son's grave and going to Church. Reina Luisa Tamayo is the mother of Cuban martyr Orlando Zapata Tamayo who died in prison while on a hunger strike protesting inhumane conditions from the communist Cuban government. For 3 whole month the Castro regime's thugs and armed military personnel prevented Reina Luisa Tamayo from attending Church and visiting her son's grave all the while yelling insults at her. (Picture 1 and 2) Dr. Ferrer's wife Yusmaini being dragged on the floor. Two 2 Damas De Blanco being draagged on the floor by their arms and legs. 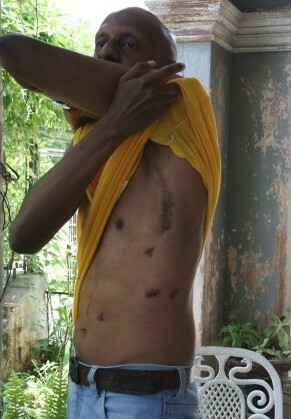 (Picture 3 and 4) Guillermo Farinas showing the scars he sustained by beatings from Castro's regime. 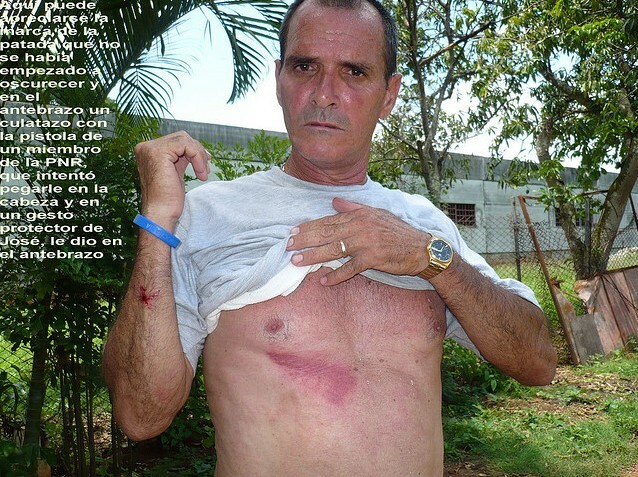 Guillermo Farinas near death from a hunger strike in protest to inhumane conditions in Cuba. 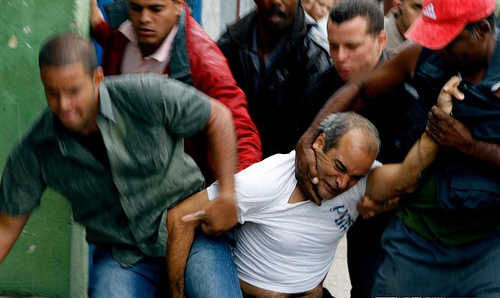 Cuban dissident being assaulted and dragged by Fidel and Raul Castro's plain clothe hooligans. Woe! to you Castristas, Castro sympathizers that oppress the Cuban citizens like you've oppressed my parents and grandparents, for your oppression will be tenfold of what you've inflicted upon the Cuban citizens. Woe! to you commies, for you have but a limb left in a game of hangman.